There are many fun, creative and inviting ways to display quilts. Some are approved by quilt preservationists and some are not. Only you can decide which path is right for you. Before we explore the various options lets cover some of the basic quilt handling do’s and don’ts. Ultraviolet Light from the sun or fluorescent lights will breakdown fabric dyes and accelerate fiber oxidation. Heat and Humidity can also damage your quilt. The ideal environment for your quilt is a temperature between 65-75 degrees with a humidity level of 45-55%. Storing quilts in the uncontrolled environments of attics and basements is not recommended. Moth Crystals are often used to repel unwanted creatures. Their use is not recommended with quilts because of their inherent health hazards. Cedar Chests should only be used if the quilt is first wrapped in a cotton cloth. Direct contact with cedar must be avoided because cedar is highly acidic and can cause brown spots on fabric. Natural Pest Remedy Try using crumbled dried leaves of the Artemisia plant in a cloth sack. Store that cloth sack, without allowing direct contact, in the same container as your quilt. Paper, Newspaper, Cardboard Non acid-free paper, newspaper and cardboard all contain harmful decaying agents. Allow only acid-free paper to come in contact with your quilts. Wood must be sealed with polyurethane to protect fibers from the chemicals it emits. If you are unable to coat the wood with polyurethane then place a barrier of washed cotton fabric between the wood and the quilt. Plastic containers, dry-cleaner bags, heavy-duty plastic bags, garment bags and Styrofoam are never acceptable for storage. All of these items emit harmful vapors. Store Quilts folded and padded with acid-free tissue in acid-free containers. Clean cotton sheets or washed, unbleached muslin can also be used to wrap your quilt before placing in the container. Metal is also not recommended. Protect your fabrics from metal by either lining the metal with washed cotton, muslin or acid-free paper. Dust, Dirt, Body Oil, Perfume, Food and Smoke will all shorten the life expectancy of your quilts. Avoid contact with these hazards. Remove dust through careful vacuuming. Wear cotton gloves to protect fibers from your body oil, perfumes and other lotions. Prohibit smoking. The smoke from cigarettes can leave not only a film but also an odor on your quilts. Folding and Stacking quilts can be detrimental as well. If left in the same position for an extended period the creases created from the folds can cause uneven wear. When stacking folded quilts, limit the quantity. Weight caused from piles of stacked quilts can create hard to remove creases. Every three to six months unfold your quilts and then re-fold them from a different direction. Tacks, Nails, Staples and Clip On Metal Hooks should not be used to hang your quilts. All of these items can put stress on the fibers. The stress can cause micro tears in the fabric. Use a hanging or rod sleeve to suspend your quilt on the wall. Even when using a hanging sleeve periodically remove the quilt and allow the fibers to rest. Use that opportunity to remove dust through careful vacuuming. While my list might not be complete, it certainly gives you a lot to ponder. As I said above, only you can decide how your quilts will be handled. Now, let me share a few options for creatively displaying your quilts. Please follow the above guidelines for adapting these display techniques. Quilt Blocks Almost everyone has left over quilt blocks. Rather than leave them stacked away somewhere why not mount them on mat board and insert them into a frame with non-glare glass. Arrange them on your wall for a unique collage of quilt art work. Hang them on an Old Piece of Fencing Stand the fence on end and drape the quilts over the spindles. Be very careful to protect your fabric from the wood and its old finish. You could drape clean cotton fabric or muslin over the rungs and then lay your quilts on top of that. Stack Folded or Rolled Quilts on Shelves or Cabinets This is a wonderful way to add a variety of color to your decor. Rotate your quilts to change the display even more. Be aware of the suggestions about stacking quilts and contact with wood. Attach a Hanging Sleeve to the back of your quilt or wall hanging. Insert a rod into the pocket and you’re ready to go. If it’s small like a wall hanging you could attach a ribbon or string to either end of the rod. Find the center point of the ribbon or string and hang it from a single nail on the wall. Once the ribbon or string is hung over the nail a button could be used to hide the nail. Simply slide the button over the nail through one of the buttons holes. Chair Pads Find tattered old quilts at auctions, garage sales or flea markets. Salvage the usable portions and transform them into covers for kitchen chair pads. Headboard for a Bed Suspend a curtain rod on the wall above your bed. Drape one of your quilts over the rod as a headboard. Bolster Fold and roll a small quilt into an oblong shape. Fasten an old belt around the middle to secure it from unrolling. Use the rolled quilt as a bolster on a bed or other piece of furniture. Table Cover Drape a quilt over a small side table for a decorative cover. Make sure the table has been finished with a layer of polyurethane. 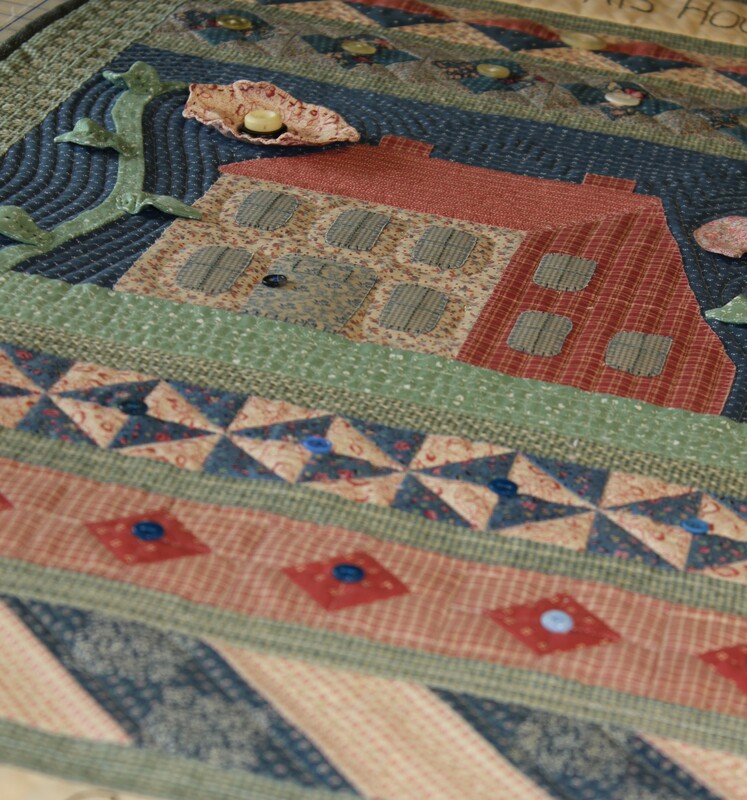 There are so many ways that you can use your quilts to adorn your home or craft area. Only your imagination can limit the possibilities. Why not dig out some of those quilts and enjoy them. If you don’t your relatives will.